By adopting an economical driving style and anticipating the traffic situation ahead, you can easily reduce fuel consumption by 10 to 15%. A car uses most fuel when accelerating. If you think ahead when driving, you will need to brake less and thus accelerate less. Wherever possible, let the car roll slowly to a stop, for instance when you can see that the next traffic lights are red. The engine and catalytic converter need to reach their proper working temperature in order to minimise fuel consumption and emissions. The outside temperature has a decisive influence. The different rates of fuel consumption for the same distance at both +20 °C (+68 °F) and at -10 °C (+14 °F) are shown in . The correct tyre pressure reduces rolling resistance and therefore fuel consumption as well. Furthermore, raising the tyre pressure only slightly (+ 0.2 bar / + 3 psi / + 20 kPA) can also save fuel. If you are willing to accept a small loss of driving comfort, the tyre pressure recommended for a fully loaded vehicle can be used at all times. This also applies if you are driving alone and without any luggage. When purchasing new tyres, always make sure that the tyres have optimum rolling resistance. Fully synthetic low viscosity engine oils reduce fuel consumption. Low viscosity engine oils decrease frictional resistance in the engine and spread better and more quickly, especially for cold starts. They are especially effective in vehicles which make a lot of short journeys. Always make sure that the engine oil level is correct and that you keep to the service intervals (oil change intervals). When buying engine oil, always make sure it complies with engine oil norms and has been approved by Volkswagen. The lighter the vehicle, the more economical and environmentally-friendly it is. An extra weight of 100 kg can increase fuel consumption by up to 0.3 l/100 km. Remove all unnecessary items and loads from the vehicle. 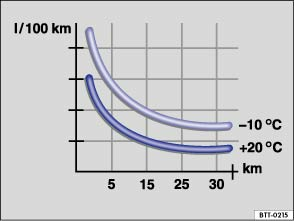 The more aerodynamic a vehicle, the lower its fuel consumption. Fittings and accessories, such as roof carriers or bicycle carriers, make the vehicle less aerodynamic. Therefore, remove any fittings and luggage carriers which are not being used, especially if you are going to be driving at high speeds.